The Healthy Voyager: She's Green on the Go! Keep up with all the goings-on in the world of Glee. We first became acquainted with the lovely Carolyn Scott-Hamilton, a.k.a. The Healthy Voyager, at the Go Green Expo this past spring. This delightful dame counts world traveler, vegan chef, holistic nutritionist, and executive producer among her many titles. She’s also got a great website, radio show, web series, and blog! She was kind enough to take a few minutes from her busy schedule to tell us about all the neat stuff that she does. Q: How did you come up with the idea for The Healthy Voyager? A: I’ve been vegan for over 12 years now and early on. It wasn’t easy here in L.A., let alone when traveling. I began to keep a journal of places I went and created a travel show around it. I figured I wasn’t the only one who struggled, as there were so many other diets that people followed– such as gluten free, diabetic, kosher, etc. So I decided to start the blog and web series in 2006, and the rest is history! Q: What is The Healthy Voyager all about? A: It’s about healthy and green living. All aspects, from eco gardening and health news to special diet recipes and traveling with dietary restrictions. You’ll find all sorts of great tips and tricks on how to love a happier, healthier and greener life! Q: How has it changed and expanded over the years? A: In 2006 it was just a weekly blog and then I added the web travel show. In 2009 I created a new website that housed the blog and videos as well as shopping. In early 2010, the site was re-vamped to have multiple articles, recipes, videos and resources, so it officially became a lifestyle brand and not just travel. We’ve also added a radio show, cooking show, fitness show, weekly product recommendations, a green show and a celebrity interview show! And the 1st cookbook is due out in 2011! Q: What’s the most fun part of doing what you do? A: Helping people. I love that my passion for food, health, travel and eco living helps others do the same in an entertaining as well as affordable way. Q: What’s the most challenging part? Q: What has surprised you along the way? A: How big the vegan movement has become. It was very “niche” for a while, but now I see it everywhere. There are a ton of blogs, sites, books and celebrities now as opposed to when I got started. It’s great fun to see it hitting the mainstream. Q: What lies ahead for The Healthy Voyager? Q: How can folks connect with you? A: Log on to www.healthyvoyager.com and go to the “contact” section. I answer all of my emails and love to help wherever and whenever I can! I am also on Twitter (@HealthyVoyager) as well as on Facebook (The Healthy Voyager fan page). Q: Anything that you would like to add? A: I’ve got new and exciting content every week, so be sure to build a profile under our social networking portion of the site as well as subscribe to the weekly newsletter. Subscribers get a first look at new articles, recipes and videos, as well as first dibs on contests and special offers! Featured Fan: Yo, Ham O.! Sorry, Dogs: No Gum for You! Hey, Hey, It’s a Giveaway! Glee Gum in Select Target Stores! Save Big on Glee Gum Pouches! Green Halloween: Still a Scream! Natural News: Help the Bees, Please! Gum in School? This Time, It’s Cool. Is That Your Natural Color? Tomorrow in Miami– Wish We Were There! What Can You 'Git into a Chocolate Kit? Snack Attack Part 2: What You Can Do! Win a Book to Turn Your Parties Green! Buy Two. Get One Free. Yippee! Hey, FDA! Label GMOs, OK? Sweet Ways to Stock up for Halloween! Whole Foods, Weis, World Market, WOW! UK Goes the Veggie Way! The Make Your Own Gum Kit, in Action! Braving the Cold, Heading to Canada! There's Still Time to Get Creative for Valentine's! Find Glee at the Fancy Food Show! 2 Days Left to Vote for the Gummies Kit! Awesome Author Discusses New Book About Gum! Neat New Uses for Chicle! Glee on NBC, Woo Wee! Congrats to the First Sweepstakes Winner! Glee Gum Paints the Town (and TV, and Internet) Green! Green Halloween: It's a Scream! Our Fearless Leader Featured in an eBook! Hooray for the Climate Action Giveaway! Your Ticket to Glee! Win a Trip for Two, Yippee! A Forum for Fans of TV's "Glee"
Ode to Glee: Poetry Contest Winners Delight Me! Win a Case of Wee Glee with Celebrate Green! Watch Out for the Rampage! Chicle Book Is All the Rage! Time to Celebrate National Candy Month! Chew Glee, Watch "Glee" TONIGHT! Green Spotlight On… Trees for the Future! Black and White and Read All Over! Such a Treat to Be Featured in Bon Appétit! Maryland May Ban Artificial Food Colors! Casting a Green Spotlight on… ForesTrade! Hey La La Land, Look What I've Got Planned! Glad Tidings from Glee! Plus Recycling Tips, For Free! Thanks Be to Those Who Inspire Glee! Bringing Glee to Washington, DC! Glee Puts the WEE in HalloWEEn! A Hit for Halloween: Mini Glee Variety is Sheer Poetry! Vegetarians of the World, UNITE! Feingold Diet Fine By Us! Nominate Glee for Green Business of the Year! A Few Reviews, Some Ship-shape Shout-outs, and More! Fancy Food Show? Fancy Meeting YOU Here! Rhode Island Pride, Festival Fun! Modern Gear TV Likes GLEE! No Snubs from "Candy Snob"! Glee Goes Green at a Big Apple Expo! Chock-Full of Reasons to Chew! Glee Gum is Rachael Ray's SNACK OF THE DAY! 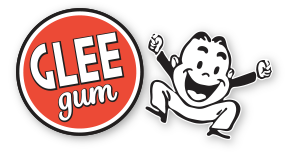 Two New Gleeful Flavors, More Gum to Savor! Introducing Me, the Glee Guy!